Today, we are going to show you a house that was built for a young couple with a child by design professionals Lethes House. The residents knew exactly what they wanted! One of their requests was to integrate the home into the landscape, which features a river and a forest. They also wanted the home to be eco-friendly. Thus the home that we are going to explore today is a traditional wooden house, which was built in a very short space of time. It was completed in three and a half months! In this ecological house, the heating of the environment is achieved by a wood burner as well as a heat pump, which circulates waste water. There is also a forced air ventilation. 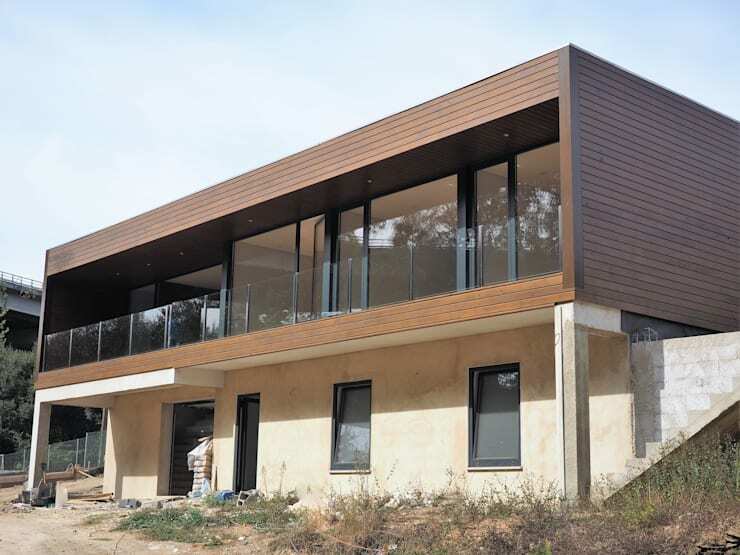 These types of home are somewhat different from modular homes as they are made from a solid, wooden materials. They are also attractive with modern or contemporary lines. You must be curious to start exploring! Let's take a look! Are you impressed with this final home?! Despite the ecological factors and the speed of its construction, this home is very different to a traditional prefabricated wooden house. This house features a very modern and personalised design. 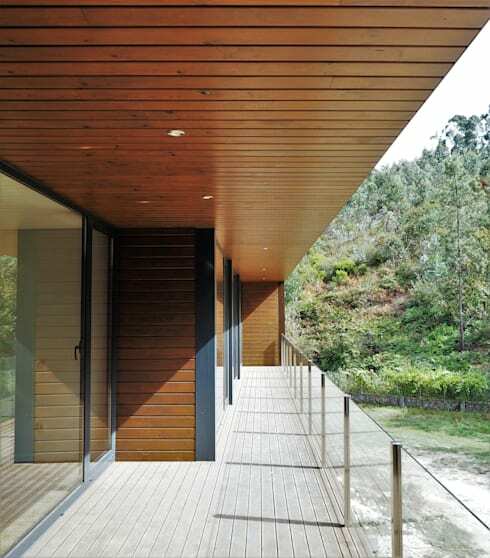 Straight, clean lines dominate, while wood makes up the majority of the second floor. It also features an abundance of glass thanks to the large windows and doors. 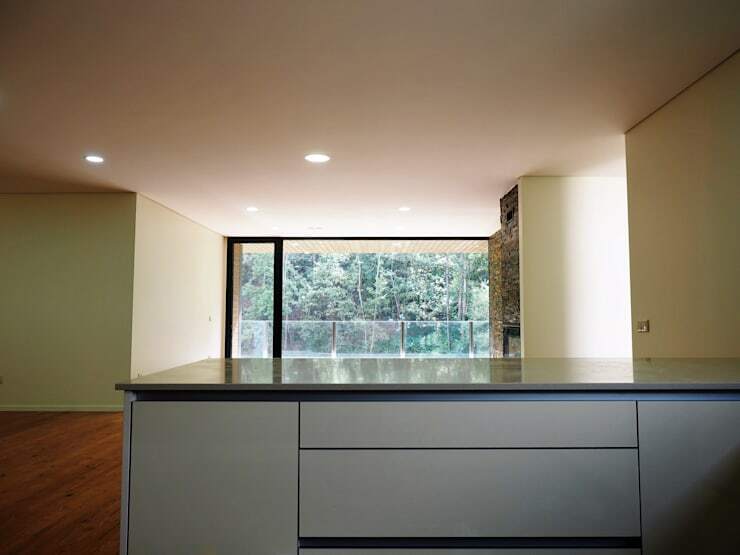 This allows natural light to flow into the home and creates a wonderful connection between interior and exterior spaces. So, now let us take a look at the construction process. In this image, we come across the construction process, which only took three and a half months. This is a very incredible achievement and met the needs of the residents. In this image, we can see the construction material. Wood is the dominant material on the upper floor. This space is fantastic. The house opens up onto a gorgeous open-air yet covered terrace, which can be accessed from several rooms of the house. This is the perfect space between the interior and the exterior areas, allowing the family to enjoy the surrounding landscape. The use of wood and glass makes this area rustic yet very sophisticated and elegant. 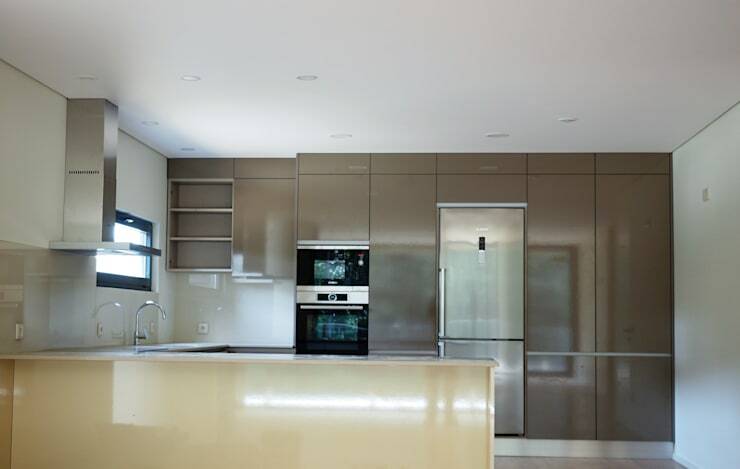 The interiors are just as modern as the exteriors, as you can see in this image of the kitchen. Spacious and with plenty of room for all of the furniture, including the modern appliances, this is the most convenient and savvy cooking area. It also integrates a kitchen island, which is a very practical element in this space. This is great for cooking but it can also be great for socializing. Have a look at these other kitchen islands to treasure for inspiration for your own kitchen! Being a modern house, it's not difficult to predict that the kitchen is part of an open plan space that also integrates the living space into the area. From this image, we can see how the kitchen island subtly separates these spaces, but there are no walls to constrict the rooms from one another. The living room features a large window with a view of the beautiful surrounds. The kitchen also benefits from this window. On colder days, there is no lack of comfort in the living space. The room includes a wood burning stove, which heats the house. 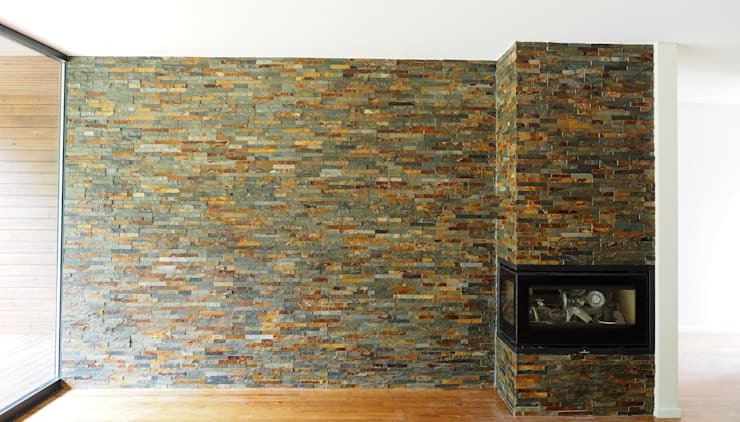 This area is covered by a clad stone wall, which introduces a variety of colours and textures to the design. 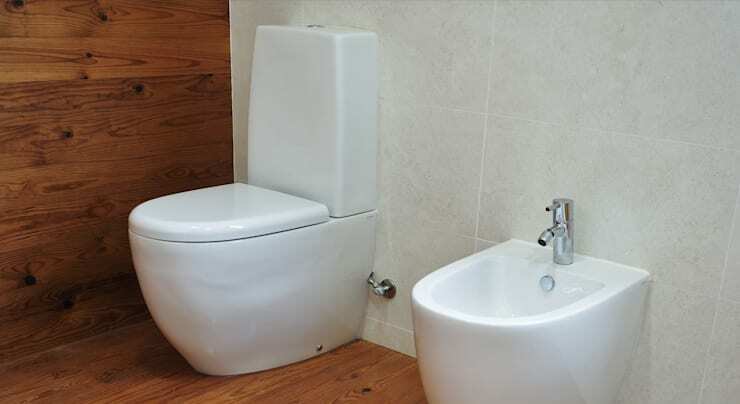 The bathroom features very modern finishes. This area also features an abundance of natural light, which is an advantage to any space. In this image, we can see how the bathtub and tiles on the wall reflect natural light, creating a bright and light spacious looking room. The decor is simple, with beige tones dominating. This creates a pleasant and harmonious environment. 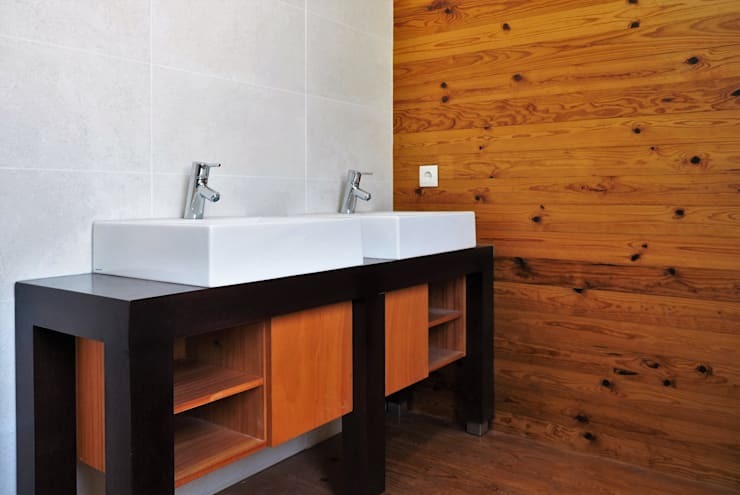 Do you notice how wood has been integrated into the bathroom design, bringing comfort and style to the space? The sink features a cabinet underneath, which keeps personal items stored neatly out of sight. 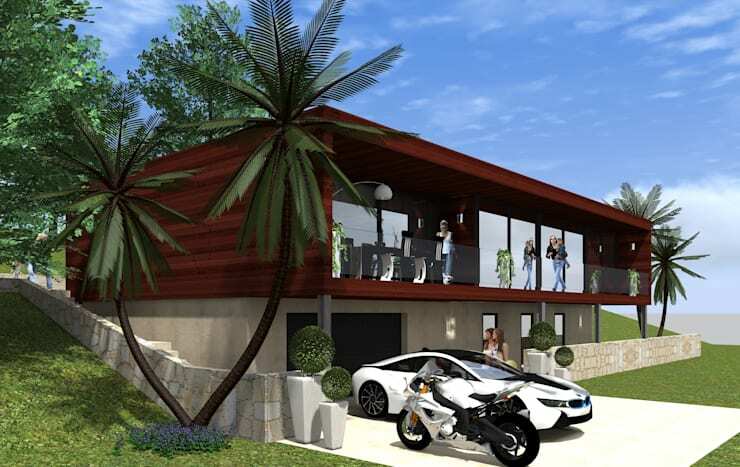 The design of the home is very influenced by the needs and desires of the residents. 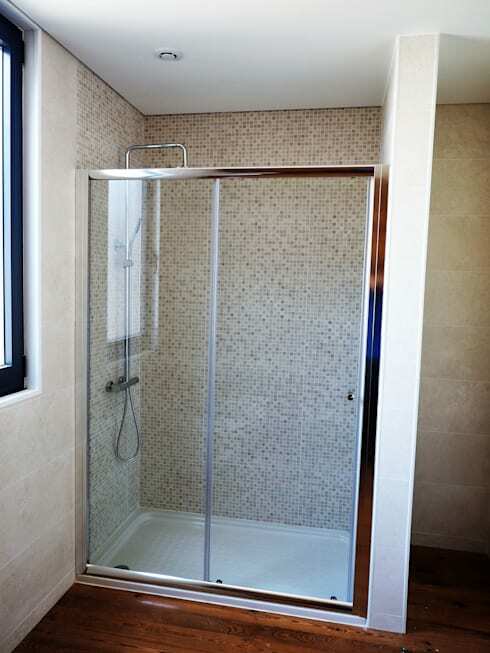 They wanted a modern style throughout the house, including in the bathroom. From this image, we can see how they have achieved exactly that. This bathroom looks very modern and comfortable! This computer-generated image of the house was made before the house was built. You can see that it corresponds perfectly with what we see as the final result after three and a half months. Don't you love how the home moulds beautifully into the landscape? If you like this home, you'll love this white wooden house that's charming and warm.